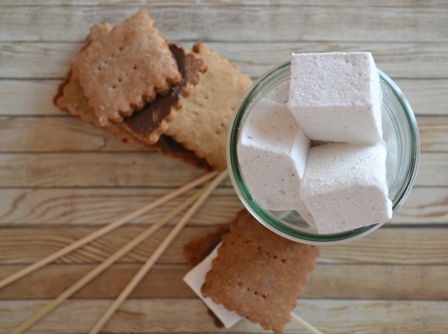 Who doesn't love perfectly roasted marshmallows squished between cookies and chocolate? I have yet to meet someone who doesn't love a good s'more. Do you like them lightly roasted or good and toasted? Serving s'mores is fun and easy for entertaining, and you don't have to be camping to enjoy this treat. You can make them indoors or outdoors, with many variations of cookies and chocolate. I have received so many questions from fans regarding flame sources for roasting and toasting marshmallows, so I thought I would share my tips with all of you. I contacted Sterno Candlelamp, the company that makes a variety of fuels for dining and camping. I love the convenience of Sterno fuel because you can light it, use it, and then extinguish it and save the rest for a later use. It is important to note that there are many fuel sources that are NOT for direct contact with food. Sterno Candlelamp recommends their Sterno Ethanol Cooking fuel in gel form (not wick form). This product is specifically made for direct food contact and does not contain chemicals that other fuels contain that are not made for direct food contact. Sterno can be purchased at kitchen stores, restaurant supply stores, or even outdoor sporting goods stores. We are anxiously awaiting the arrival of spring here in the North, but until then, we will continue to enjoy our s'mores indoors. Let me know if you make some indoors and your favorite ways to serve them!